The Anniston Field Office (AFO) is an element of the Assembled Chemical Weapons Alternatives (ACWA) program located at the Anniston Army Depot, Alabama. Its mission is to support destruction of the chemical weapons stockpiles located near Pueblo, Colorado, and Richmond, Kentucky. 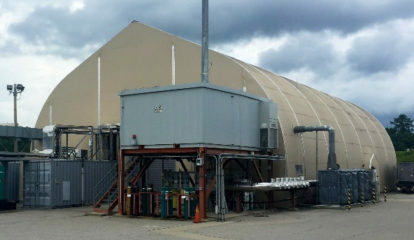 Prior to becoming part of the ACWA program, many AFO personnel were assigned to the former Anniston Chemical Agent Disposal Facility (ANCDF), which completed chemical demilitarization operations in 2011. At the completion of the ANCDF mission, most the facilities were dismantled, with the exception of the Static Detonation Chamber (SDC), which was clean-closed for chemical agent, a process which ensured no chemical agent remained in the entire system. The Anniston SDC augments the Pueblo Chemical Agent-Destruction Pilot Plant by destroying non-agent contaminated explosive components from the Pueblo stockpile and will serve as a training site for personnel that will operate a similar detonation chamber at the Blue Grass Chemical Agent-Destruction Pilot Plant. How Does SDC Technology Work? The SDC is an electrically heated containment vessel used to destroy munitions and explosives. Items are fed into the detonation chamber, which is heated to approximately 600 degrees Celsius or 1,100 degrees Fahrenheit. Energetics are destroyed by thermal decomposition. Gases generated are treated by an off-gas system that includes a thermal oxidizer, scrubbers and a carbon filter system. How Will the AFO Support Chemical Weapons Destruction in Colorado and Kentucky? The Pueblo chemical stockpile originally consisted of more than 2,600 tons of mustard agent in projectiles and mortar rounds. The Pueblo plant is using neutralization followed by biotreatment, along with the Explosive Destruction System, to destroy the stockpile. Explosive components removed at the Pueblo plant are monitored for mustard agent and shipped to the Anniston SDC after they are determined to be non-contaminated. The Anniston SDC is capable of providing a dedicated, efficient source for explosives disposal, as well as opportunities for additional non-chemical agent waste disposal research and investigation. The Blue Grass chemical weapons stockpile contains more than 500 tons of weaponized blister and nerve agent in rockets and artillery projectiles, including approximately 15,000 mustard projectiles that testing shows are likely to contain solidified mustard agent. As such, these munitions are unsuitable for the main plant’s automated processing systems and will instead be processed by an SDC that will be operated on-site at the Blue Grass plant. The active SDC in Anniston provides an opportunity for Blue Grass operators to work with experienced operators and complete training before Blue Grass SDC operations begin.